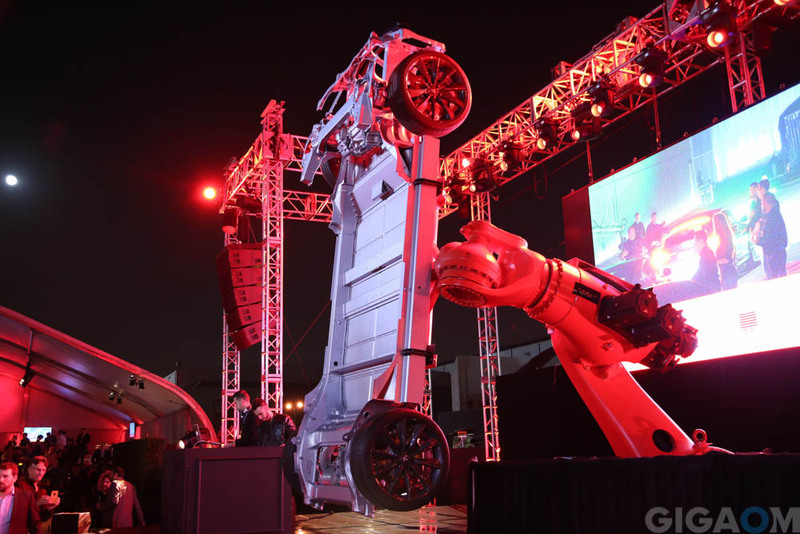 At a high level, there wasn’t much revealed at Tesla’s “Model D” launch (our live blog here) that “the Internet” didn’t already predict pretty accurately: the Model D is a souped up dual motor, all-wheel-drive version of the Model S that can go zero to 60 in just over three seconds. But after talking with Tesla execs, and doing a test drive of the car itself, at the launch event, I got a much more complete picture of the new functions and options (and if they’re worth it or not) as well as how the autopilot technology actually works. First the “D” or the “P85D,” which is the highest performance, dual-motor version of the Model S that has the 85 kwh battery. Tesla CEO Elon Musk didn’t mention the price onstage and Tesla has yet to send out any specs (at least to me) on it. So. . . Tesla execs say they are charging $120,000 for the base version of this car, and with all the bells and whistle it can creep up to close to $140,000. Whoa! Tesla’s P85D under the glowing lights of the launch in Hawthorne, Calif. Yep, it looks just like the Model S. It’s what’s inside that counts. Image courtesy of Gigaom, Katie Fehrenbacher. The base model of the P85D is $14,600 more expensive than the high end Model S with the 85 kwh battery pack. Tesla execs tell me the P85D will be available in December in North America and February in other places. “The D” doesn’t just have the dual motor, it also has what Tesla is calling “the technology package,” added onto it, and other high performance features. So if you just want to go hog wild and spend what you would on a high end sports car, but also get a four-door sedan, then this is for you. Is the Model S supercar really worth $14,600 more and then some? Well, a Tesla driver, who took me and a couple other journalists on a super short test drive, says that the P85D is the fastest, highest performance, four-door car anywhere out there on the market. The acceleration of zero to sixty delivers 1G of acceleration. It has 691 horse power motor power — 221 horse power in the front and 470 horse power in the rear. I don’t know if this quick test drive video does it justice, but I was in the front passenger seat of the car, and you can see by the video (and our awkward responses) that the acceleration is intense. It is a little like a roller coaster. It’s like when I rode in the Roadster for the first time. But, sports car fans will probably be very used to this feeling. 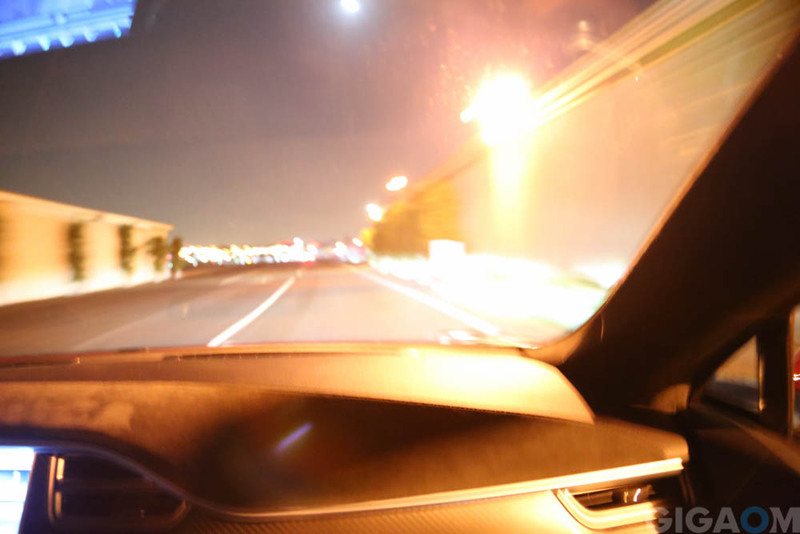 This is what the accelerating P85D looks like from the outside perspective. Yes, less impressive. 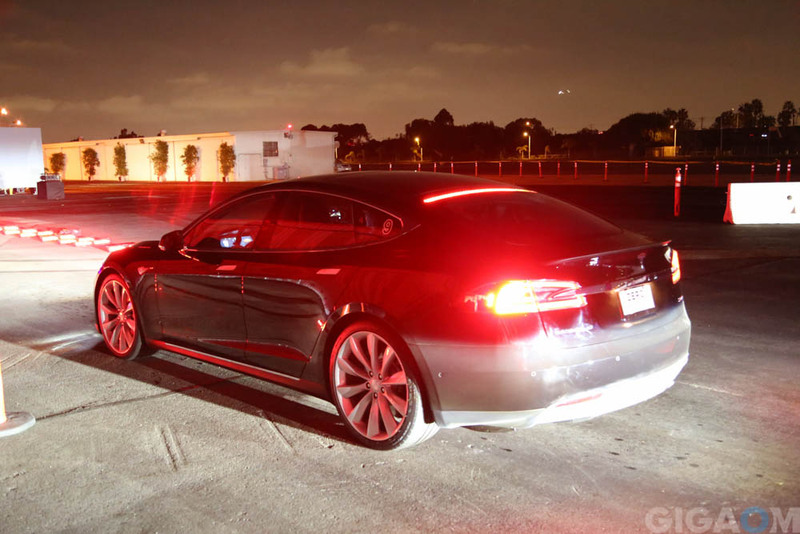 The P85D is Tesla’s ultra performance Model S car. Customers can also eventually buy dual motor versions of both the 85 kwh battery pack and the 60 kwh battery pack but without the other high performance features. And now onto the “technology package.” This is important because this suite of features is what unlocks the newly enabled “autopilot” functions on the Model S that Elon Musk was showing off during the launch event. The “technology package” will cost an extra $4,250 — yeah, I know, I thought it would be another free upgrade to the Model S. But hey, Tesla wants to get paid this time for all its extra engineering. So with the autopilot software, the Tesla Model S can do some things now, and some things down the road. During the test drive, our Tesla driver showed us how the car can read speed limit signs and notify the driver if they go over the marked speed limit. Tesla Model S cars with the tech package will be able to do this today. The core of the Model D, at the Tesla launch event. Image courtesy of Gigaom, Katie Fehrenbacher. The autopilot can also follow lanes and adjust around turns and curves without the driver turning the wheel. Now that is cool. This feature will be available down the road. Some publications, like USA Today (thanks for breaking the original embargo), have noted that Tesla is actually playing catch up with its driver assist functions. But now with these new features it is potentially surpassing competitors on driver assist. So how does the autopilot work? The hardware has actually already been installed on all Model S cars as of two weeks ago, said Musk when he was onstage. The Model S autopilot uses 12 sensors on the bottom of the car — 6 in the front and 6 in the back. It uses a front-facing camera next to the rear view mirror, which I would guess is close to being as intense as the Google self driving car camera. It also has a radar system under the nose of the car that senses what’s in front of the car. Autopilot driving with the Model D. Image courtesy of Gigaom, Katie Fehrenbacher. Using smart software and these sensing systems, the Model S (when enabled with the tech package) can read speed signs, recognize animals and objects in front of the car, can recognize lanes and lane changes, and can see far better than a human can through fog, rain and dust storms. Musk was touting some of the more futuristic things the Model S could one day do with this type of tech during the launch event, like self parking or just arriving when summoned. But that’s a bit out there, and Musk acknowledged that Tesla drivers can’t just go to sleep and land at the destination. So, what do you think? Want to pay close to $140K for a high performance four door electric sedan? Part of me looks at these announcements, and thinks: Tesla seems like it really wants to continue to monetize the Model S for as long as possible before it launches the Model 3. Does that mean the Model 3 might be farther out than we originally thought and not meet the low price expectations? Or is Tesla just trying to push the engineering envelope with its signature car? I guess we’ll see. Saying that the tech package upgrade isn’t free is misleading. There are those who wouldn’t have gotten the tech package and still won’t. But they get the safety features and features such as parking assist, and that saves them $500 compared to getting the latter as an option before the change. Those who would have gotten the tech package and the parking sensors anyway will pay the same as before. I see that as a free upgrade. It sounds like Tesla has a very successful and profitable product and has little incentive to move down-market, so yeah they could easily push the Model 3 out a year or two, especially if they encounter any hiccups with the gigafactory. I’m guessing that Musk has a couple more surprises up his sleeve, like moving the X up a little earlier and a new battery formula that will be leaps and bounds ahead of competitors. After all, why build your own factory in an emerging technology if cost savings is all you get? You risk being scooped by anyone with a better mousetrap. Early adopters will always pay more. Look at the prices of 4K TV sets last year and this. For this level of tech, if you have to ask how much it is, you can’t afford it. So what’s included in the autopilot if the tech package is not marked since all of the sensors are standard? These options are no doubt to improve the gross marging on the Model S and is needed to finance the Model 3 and the Gigafactory. Will it mean Model 3 will be build later and will end up more expensive than we are led to believe? It will all depend on the number of Model S and X Tesla is able to sell. Not only could that create the free cash flow needed, but it could also bolster the TSLA share price which would make a new financing round so much more easy to do. $140’000 for a loaded P85D is expensive? A base Panamera Turbo S (“only” 3,7s 0-60) will set you back $180’000. So jealous! I guess that’s the point. Kudos to the team at Tesla for continuing to innovate.